Just a few weeks left until Christmas and I think I’m almost done decorating! I try to focus on the rooms where we spend most of our time, and the kitchen definitely qualifies for that! For our family areas, I like to keep the look relaxed and casual and welcoming. 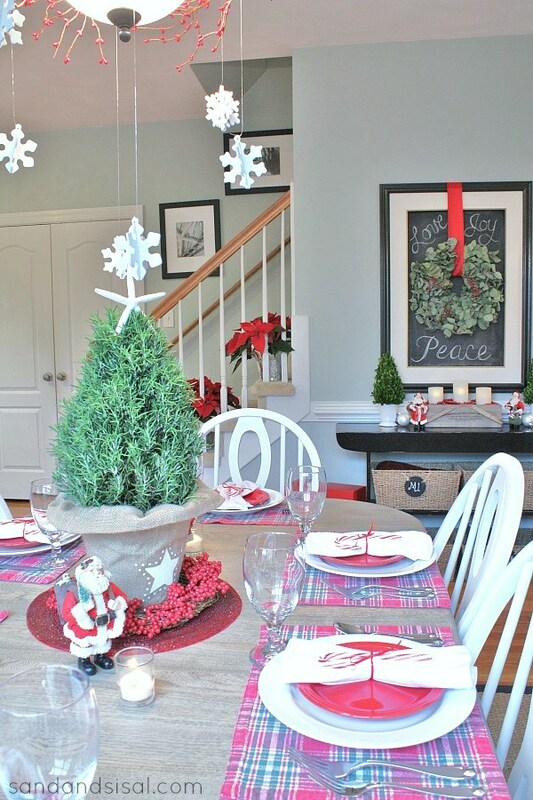 So with the help of a few fresh items from ProFlowers I created a Casual Christmas Tablescape and turned our chaotic kitchen and dining area into a festive family space. (This is a sponsored post with Provide Commerce & the Social Media Chicks. All opinions are my own. I absolutely love the smell and flavor of rosemary! I liked the casual and rustic look to this Burlap Potted Rosemary Bush with a painted star on it. I placed it inside an inexpensive 2.50 wreath I picked up from Target last year. I like using wreaths as parts of a centerpiece, just like I did for my Thanksgiving Tablescape which used a gorgeous dried ProFlowers wreath. To just brush you hand across the soft needles of the rosemary and smell the magnificent aroma is amazing! Best of all I can plant this outside and have fresh rosemary all year long (It thrives in our area). A plant that keeps on giving… how could I resist? Of course I had to give the rosemary tree a bit of my coastal touch, with a starfish tree topper! The season can get hectic enough, so why complicate it more with fussy-mussy table settings? 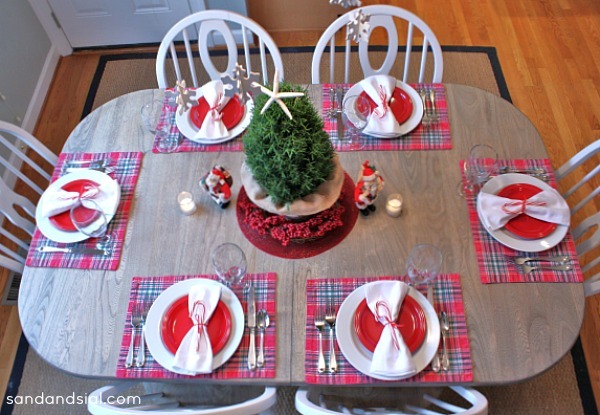 These white and red plates are what our family uses year round and the place mats are probably over a decade old! Shhh! Yes, they are faded and have been washed a gazillion times, but we’re going for relaxed and casual, right? 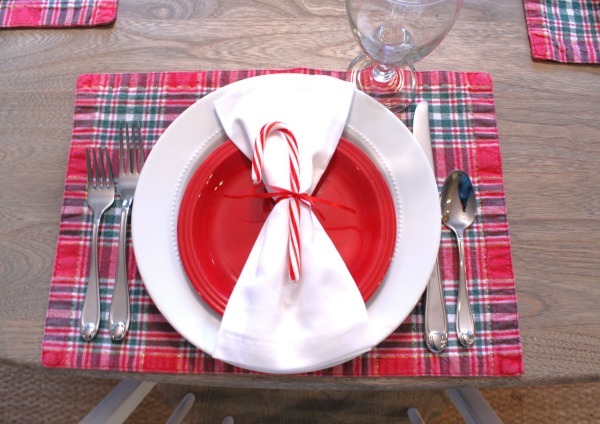 No fuss napkin rings made from simply a red ribbon and a candy cane gives the plate a sweet and special touch. Here’s a look from my office, across the kitchen. I’d show you my office, but it’s a total disaster, and there is a pile of dishes in the sink that I’m sure you do NOT want to see. I took this photoshoot opportunity to dump each one of the kids’ baskets in their rooms (they are not very pleased about that! ha!). That little black thrift store console table with the baskets has been my favorite solution ever to the clutter. It solved the issue of my disastrous staircase tsunami! Now instead of shoes and books, and clutter on the staircase I can actually place some poinsettias. One of our family’s communication hubs is our wall painted chalk board. (It’s painted directly on our wall and then just surrounded by a recycled frame). I fell in love with this fragrant and beautiful Eucalyptus Wreath with Red Berries and placed it in the middle with a few inspirational words around it, love-joy-and peace. This is another wreath that will keep on giving because it comes delivered to you fresh but will dry and look exactly the same! I can use it year after year! Now that is a great investment! 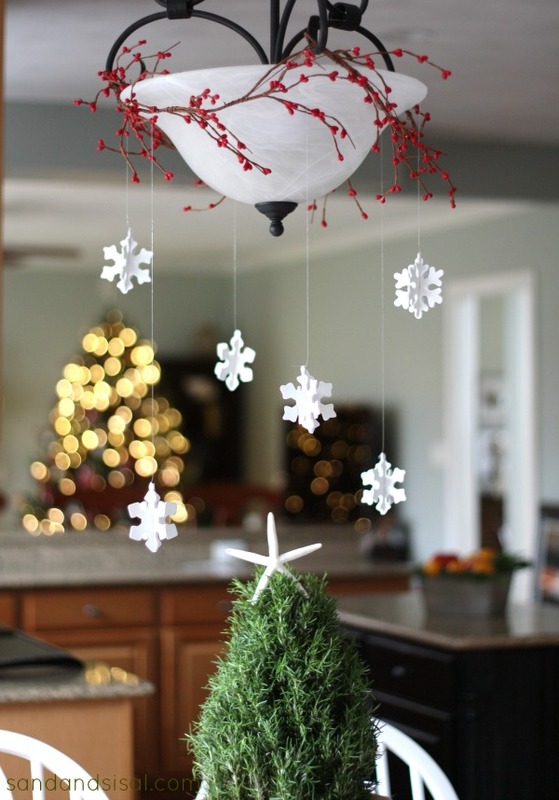 And to keep the overall look whimsical and light, I found a bunch of natural balsam wood snowflake ornaments, spray painted them white with spray primer and hung them from the table chandy with hub’s fishing line! So simple! The Casual Kitchen Tablescape has gotten my kids’ approval so I must have done something right! That is worth celebrating! Feel free to check out our Red & White Christmas Mantel and family room too. Sand & Sisal readers can get an exclusive 20% discount off of all of your RedEnvelope and ProFlowers purchases through 12/31/13. Start shopping at RedEnvelope here or order from ProFlowers here. The 20% discount will be applied to your shopping cart once you click the colored links. Follow ProFlowers’s board Deck the Halls on Pinterest. Very pretty! You always have such great ideas. Only thing – I try to keep my centerpieces/table action low enough for everyone to see over. It is awkward for family or guests to have to keep looking around. Could you do it in a more low-profile version? I totally agree Kevin! I’m not a fan of super high centerpieces. Did you see my Thanksgiving Centerpiece? It is a dried flower wreath placed on the table and I put a glass hurricane in the center. Very low profile and visible. I just loved though how this rosemary bush looked, so casual and great for the kitchen. I use so much rosemary in my cooking that it just felt “right” having it on the table for now. It’ll be placed in my garden with my other rosemary bushes in spring. I’d say you’ve definitely done something right! It all looks lovely. 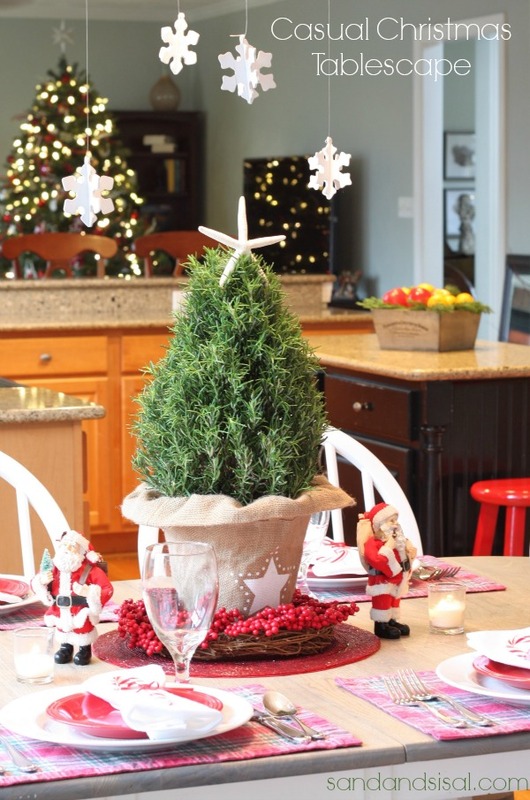 I too love the scent of rosemary and think that tree contributes to a great centerpiece! 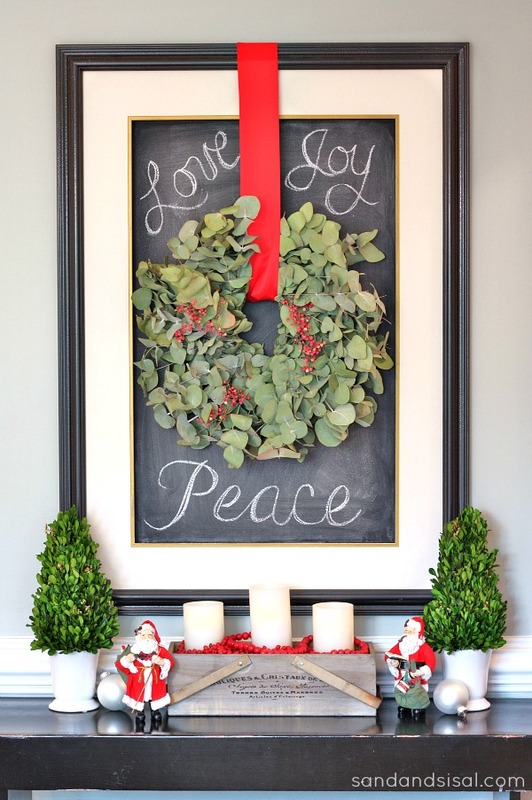 And the eucalyptus wreath is lovely in the center of the chalkboard–great idea! I like seeing a real-life table setting. While the expertly styled tables with lots of layers and varying heights look great in photos, sometimes I look at them and think, “Does anyone actually EAT at that table?” My solution this year is to fit my centerpieces on a tray that can easily be whisked away from the center of the table at mealtime, and that’s worked pretty well. Actually, now that my oldest son is grown and living in East Asia and my middle son is mostly away at college, I don’t even have to move the centerpiece aside most days! P.S. Would love to know how to get fake, but real looking ones!!! Hi Kate! Those are from Target. They have them in the stores right now. They are decent priced too. They are real, preserved boxwood. Be sure to spritz them every month though with a bit of water. Everything looks gorgeous Kim and I seriously want that Eucalyptus wreath! So beautiful! I could easily garnish my home with fresh greens all year if the budget allowed for it! All the items were gorgeous and added such a festive touch! Beautiful! Love that wreath on your chalkboard – so pretty! 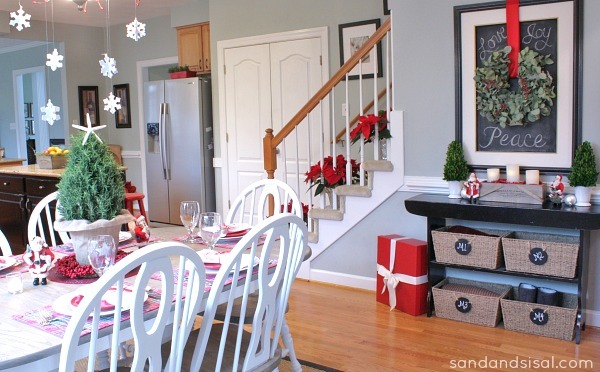 I really love the snowflakes that “float” over the table, very dreamlike.